DNA replication is tightly regulated, since errors in replication would be passed on to daughter cells and essential information could be lost. In eukaryotic cells, an important regulatory step is the activation of replication origins, which leads to the formation of two replication forks that move away from the origin. Interestingly, the order by which replication origins activate is tightly regulated, as evident from the reproducible replication time of each chromosomal region. However, the information about this order was obtained from large populations of cells, therefore overlooking rare replication initiation events. Researchers from Conrad Nieduszynski’s group have developed a high-resolution method to study DNA replication at a single cell level. They treated budding yeast cells with low concentrations of a nucleotide analogue and used nanopore sequencing to detect the incorporation of the analogue, thus identifying nascent DNA. Based on the distribution of the analogue, they could identify replication origins and replication fork movement genome-wide. This is the first time that genome replication dynamics have been characterised by single-molecule sequencing. Müller CA, Boemo MA, Spingardi P, Kessler BM, Kriaucionis S, Simpson JT, Nieduszynski CA (2019). Transcription, the process by which DNA is copied into RNA, needs to be stopped at the right time to ensure the production of accurate RNA molecules. Transcription termination is coupled with the processing of the newly generated RNA’s tail: first it is cleaved and then a string of adenine bases is appended to it. This is the achieved by the cleavage and polyadenylation (CPA) complex. 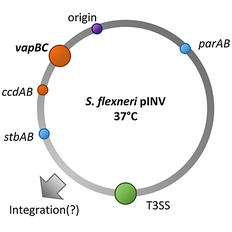 It was known from yeast studies that a component of the CPA complex, PCF11, participates in both RNA tail processing and transcription termination. Kinga Kamieniarz-Gdula (Proudfoot Lab) and her colleagues characterised PCF11 in human and zebrafish by using state-of-the-art sequencing techniques. 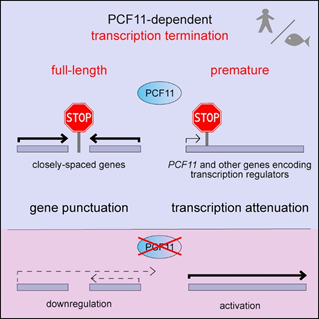 They found that PCF11 enhances both CPA and transcription termination in human cells, and is indispensable for zebrafish development. PCF11 increases the expression of genes that are close to each other by stopping RNA polymerase II from transcribing aberrantly into the neighbouring gene. Conversely, PCF11 lowers the expression of many transcriptional regulators by inducing premature termination. This research shows that transcription termination not only puts finishing touches on the RNA, but also regulates gene expression. Shigella flexneri is a bacterium that can infect the human gut and cause diarrhoea in humans. Shigella infections lead to more than 1 million deaths every year. These infections can be treated by antibiotics but a large number of deaths occur in developing countries where these antibiotics may not be available. With rising antibiotic resistance, new treatments will be needed in the future. Alzheimer’s Disease (AD) is a neurodegenerative disease, characterised by the deposition of amyloid b (Ab) in senile plaques. The correlation between senile plaques and loss of cognitive functions was first discovered in 1906. Research in the late 20th century revealed that the neurons affected are predominantly those secreting the neurotransmitter acetylcholine, and that the key enzyme terminating cholinergic signals, acetylcholinesterase (AChE), is commonly found in senile plaques. 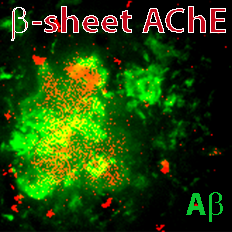 However, the relationship between Ab and AChE and their role in AD progression are not fully resolved. One of the synaptic AChE variants has a unique oligomerisation domain, a portion of which is homologous to Ab and from which peptides can be generated by insulin-degrading enzyme (an amyloid scavenger). These peptides adopt an amyloid b-sheet conformation, form amyloid fibrils and enhance Ab amyloidogenesis. The Vaux group has demonstrated that these peptides in an amyloid b-sheet conformation occur naturally in an AD transgenic mouse model, colocalise with Ab at the core of senile plaques, and are involved in disease progression. This discovery may initiate new therapeutic strategies to combat AD. Létitia Jean, Stephen Brimijoin and David J. Vaux (2019). The cannabinoid receptors CB1 and CB2 were discovered over 30 years ago. 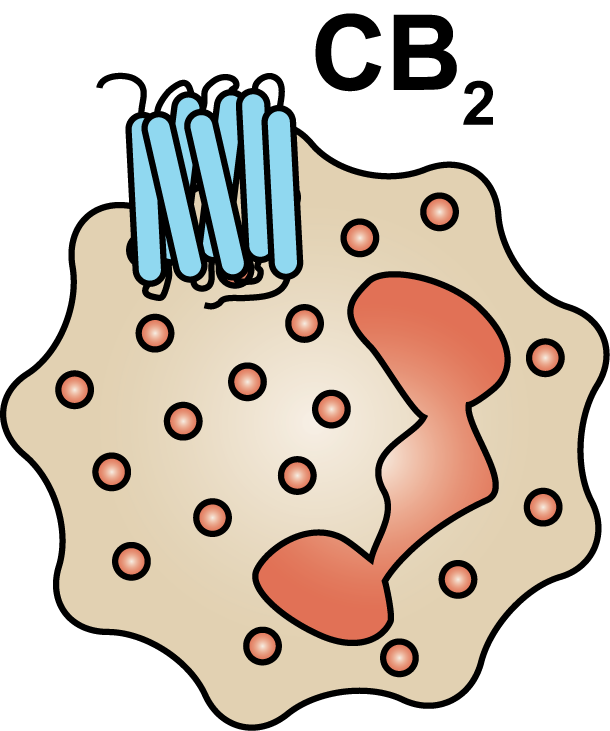 While he CB1 receptor is expressed predominantly in the brain and is well known for mediating the psychoactive effects of the recreational drug marijuana, the CB2 cannabinoid receptor is expressed in the immune system, where its exact role has remained largely enigmatic. Recent work from the Greaves lab in collaboration with Dunn School alumnus Asif Iqbal, now at the University of Birmingham, has shown that the CB2 receptor plays a non-redundant role in preventing excessive harmful inflammation. A series of experiments performed in CB2 knockout mice showed that signalling via CB2 restricts neutrophil mobilisation to sites of infection or injury, where they can exacerbate inflammation. Experiments in mice were confirmed by pharmacological experiments performed using human neutrophils. This discovery identifies CB2 as a potential target for developing new treatments that might reduce inflammation in diseases such as rheumatoid arthritis and inflammatory bowel disease. Kapellos, T. S., Taylor, L., Feuerborn, A., Valaris, S., Hussain, M. T., Rainger, G. E., Greaves, D. R., Iqbal, A. J. (2019). Cell division requires highly-controlled events to ensure faithful separation of DNA. Many of the pivotal signals governing mitosis are kinases and phosphatases that activate/inactivate protein substrates via phosphorylation or dephosphorylation. Prior to mitotic exit, cells monitor the attachment of chromosomes, via the kinetochores, to the mitotic spindle using the spindle checkpoint, which can trigger cell cycle arrest when errors are detected. 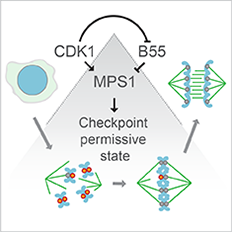 Spindle checkpoint signalling is initiated by the recruitment of MPS1 kinase to unattached kinetochores, yet how the spindle checkpoint is kept responsive to late-stage spindle defects is unknown. A study by Hayward and colleagues from the Gruneberg lab, in collaboration with the Barr and Novak labs (Biochemistry), has revealed the mechanism by which cells restrict MPS1 localisation to a defined time during mitosis. In particular, they show that CDK1-CyclinB1 promotes MPS1 recruitment and is opposed by the phosphatase PP2A-B55, which terminates signalling before mitotic exit. They nailed down the key residue in MPS1’s kinetochore binding domain (Ser281) targeted by this regulatory mechanism that allows cells to localise MPS1 and sustain the checkpoint-responsive window until chromosome segregation but not beyond, thus avoiding fatal cell division errors. Hayward D, Alfonso-Pérez T, Cundell MJ, Hopkins m, Holder J, Bancroft J, Hutter LH, Novak B, Barr FA, Gruneberg U. (2019). Cell division is regulated by the protein Cyclin B-dependent kinase (CDK1-CCNB1). A master cell cycle regulator, CDK1 promotes entry into mitosis, and also activates the proteins that prevent mitotic exit. These proteins, such as MPS1 and MAD1, are known as spindle checkpoint proteins. They function by localising to unattached kinetochores, preventing the completion of mitosis until the kinetochores of all chromosomes are properly attached to the spindle apparatus through microtubules. This ensures that daughter cells are free from errors in chromosome number. In a joint study, Daniel Hayward of Ulrike Gruneberg’s lab and Tatiana Alfonso-Pérez of Francis Barr’s lab (Biochemistry) and colleagues show that in addition to promoting mitosis, CDK1-CCNB1/CycB1 surprisingly functions as a bona fide spindle checkpoint protein. 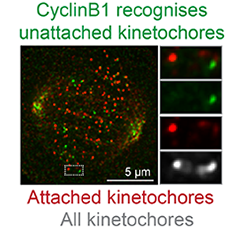 They demonstrate that CCNB1 (CycB1) is recruited to unattached kinetochores by a direct interaction with the spindle checkpoint protein MAD1. They additionally show that CCNB1 is necessary for a positive-feedback loop that recruits the key spindle checkpoint regulator MPS1 in a timely manner upon mitotic entry and sustains spindle checkpoint arrest (see RH on Hayward et al. 2019 for further details). Alfonso-Pérez T, Hayward D, Holder J, Gruneberg U, Barr FA. (2019). 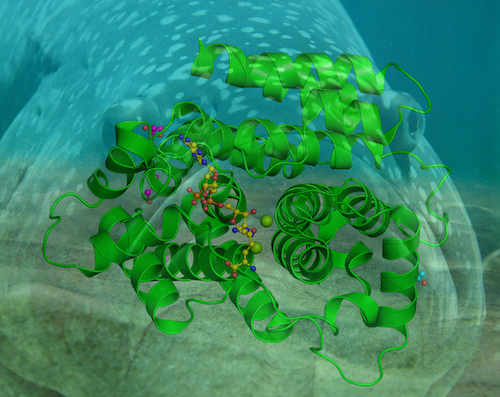 ADP-ribosylation is a post-translational modification characterised by the addition of ADP-ribose on target proteins, a modification that is placed on a variety of residues. The specific nature of the modification determines the effect on many important processes, including DNA damage responses and the regulation of programmed cell death. Rack JGM, Ariza A, Drown BS, Henfrey C, Bartlett E, Shirai T, Hergenrother PJ, Ahel I (2018). Cell Chem. Biol. 25(12):1533-1546.e12. doi: 10.1016/j.chembiol.2018.11.001. Epub 2018 Nov 21. 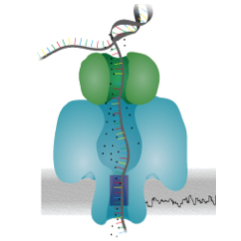 Consequences of excessive noncoding transcription unveiled. Only a fraction of the human genome codes for protein-coding genes, yet these are the most studied regions. Other elements of the genome code for non-coding RNA but the regulation and functions of these other genes remains largely unknown. Transcription, the conversion of DNA to RNA, occurs across both protein-coding and RNA-coding genes. Takayuki Nojima, Michael Tellier et al, from the Proudfoot and Murphy labs, respectively, have shown that a transcription-associated elongation factor, SPT6 plays a role in maintaining the balance of transcription between these two types of genes by modifying the chromatin. This factor can also affect the overall transcription level of long non-coding RNA genes. Higher non-coding RNA transcription can be associated with DNA damage, through the formation of R-loops, and uncontrolled transcription of non-coding RNAs can clash with the DNA replication apparatus promoting cellular senescence. 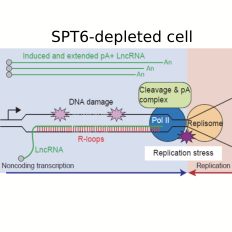 This detailed molecular study highlights the importance for the cell to control the expression of non-coding regions of the genome and indicates the presence of a molecular mechanism dependent on SPT6 differentiating transcription of protein-coding and long non-coding RNA genes. Mol Cell. pii: S1097-2765(18)30843-8. doi: 10.1016/j.molcel.2018.10.011. Caspases are protein-cleaving enzymes best known as master regulators of programmed cell death through apoptosis. Sequential cleavage steps firstly activate initiator caspases and then downstream effector caspases, to dismantle all of the cell components during apoptosis. Unexpectedly, recent investigations also implicate this protein family in non-apoptotic functions (for example cell proliferation, differentiation, and migration). Although many sensors have successfully shown effector caspase activation in vivo, few tools are available to directly monitor initiator caspase activity. This is key to fully understand caspase functions. Alberto Baena-Lopez and his group have developed a suitable sensor to visualise initiator caspase activation in Drosophila tissues. Live imaging of these sensors has revealed unknown events of apoptosis that precede the previously described stages of apoptosis in flies. Strikingly, they are also able to show stereotyped patterns of caspase activation unlinked to apoptosis in many Drosophila tissues. Their novel system reports on caspase function at both a cellular and organismal level, and it promises to provide further insight into the biology of these proteins in healthy and apoptotic cells. 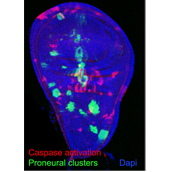 Novel initiator caspase reporters uncover unknown features of caspase-activating cells.